Median OS considering both sorafenib and regorafenib regimens in sequence was 38.4 months (95% CI, 18.5-58.4). The OS rate was 68% (95% CI, 51%-85%) at 12 months and 23% (95% CI, 2%-48%) at 36 months. In this investigator-driven, single-arm, multicenter, international phase IV trial, adult patients (n = 28) with well-preserved liver function and confirmed HCC recurrence after liver transplant were given 160 mg of regorafenib orally for the first 3 weeks of each 4-week cycle. Disease recurrence was confirmed by pathological assessment by noninvasive imaging according to the AASLD criteria and documented radiological progression during sorafenib treatment. Average patient age was 57 years (range, 19-74), 58% (n = 19) were men, and all patients had an ECOG performance status of ≤1. To be eligible, patients must have tolerated ≥400 mg of sorafenib daily for at least 20 of the preceding 28 days. Liver disease etiology at liver transplant in this patient population included hepatitis C (50%), hepatitis B (11%), and alcohol consumption (7%). Patients had an average of 26.4 months between liver transplant and HCC recurrence. Seven percent of patients had disease in the liver only, 43% had extrahepatic disease only, and half of the patients had liver and extrahe- patic involvement simultaneously. The average time from HCC recurrence to regorafenib treatment was 16.3 months. The average time following disease progression on sorafenib to regorafenib therapy was 3.6 months. Regorafenib was started an average of 14 days following the conclusion of therapy with sorafenib. Median treatment duration of regorafenib was 6.5 months (range, 0.1-23.1) with prevalent doses at 160 mg (39%), 120 mg (25%), and ≤80 mg (36%). Median OS assessed at the start of regorafenib therapy was 12.9 months in patients who underwent a liver transplant and experienced disease progression on sorafenib (95% CI, 6.7-19.1). The 12-month OS rate from the start of regorafenib treatment was 55% (95% CI, 35%-75%), and the 24-month OS rate was 37% (95% CI, 59%-15%). The disease control rate was 43% with 3 patients (11%) achieving a partial response to treatment. Regorafenib-attributable adverse events (AEs) of any grade occurred in all patients in the study. The most common AEs were fatigue (75%), weight loss (54%), dermatologic AEs (50%), diarrhea (43%), nausea and/or vomiting (36%), and arterial hypertension (21%). Less reported AEs included liver enzyme increase in 4 patients; pneumonia, 2 patients; and proteinuria, bleeding from cerebral metastases, panniculitis, aphonia, and headache, reported by 1 patient each. Grade ≥3 AEs were less common, with fatigue (25%) occurring most frequently, followed by dermatologic AEs (18%), weight loss (7%), diar- rhea (7%), and nausea and/or vomiting (7%). Two patients discontinued treatment due to AEs. Other reasons for discontinuation included radiologic disease progression, clinical progres- sion resulting in an ECOG performance status of ≥3 or systemic deterioration, death, or a decision by the treating physician that withdrawing regorafenib therapy would be in the patient’s best interest. No liver rejection episodes were observed in this population. In 5 patients (18%), plasma levels of immunosuppressive drugs increased. The study did not contemplate predefined modification of immunosuppressive regimens, and all modifications were performed by investigators according to their best judgment and local policies. Patterns of progression were assessed in 24 patients during regorafenib treatment during the study period (FIGURE). 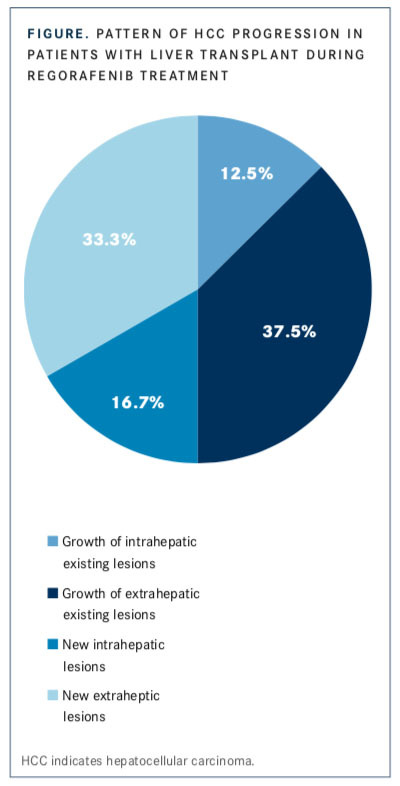 Three patients (12.5%) experienced growth of existing intra-hepatic lesions, 9 (37.5%) experienced growth of existing extrahepatic lesions, 4 (16.7%) had new intrahepatic lesions, and 8 (33.3%) had new extrahepatic lesions. Iavarone M, Invernizzi F, Czauderna C, et al. Safety and effectiveness of regorafenib in sorafenib-treated patients with recurrent hepatocellular car- cinoma after liver transplantation: an international multicenter study. Poster presented at: American Association for the Study of Liver Diseases’ 2018 Liver Meeting; November 9-13, 2018; San Francisco, CA. Poster LB-17. Regorafenib [package insert]. Whippany, NJ: Bayer Healthcare Pharmaceu- ticals, Inc; 2012.